I still remember a science class in second grade where we sampled unflavored gelatin. I had never eaten anything that had no flavor at all. It was very, very strange. Vodka cocktails remind me of that day in class. In retrospect, that gel must have tasted like something, but at that age there were only two flavors in my repertoire: “bad” (vegetables and liver) and “good” (chocolate chip cookies, maple syrup, and pizza.) “Subtle” was entirely new, and I was pretty slow to get a handle on it. Anyone who has done a vodka tasting knows that vodka is far from the odorless and tasteless spirit described in U.S. Treasury Department regulations. Vodkas can be light-bodied, medium-bodied, sweet, spicy, dry, floral, citrusy, clean, oily, yeasty—there are any number of descriptors for the subtleties of first-rate vodkas. But those flavors are simple and incredibly subtle; water aside, everything else we put into vodka cocktails masks the flavors of the vodka itself. As a practical matter, vodka is the disappearing ingredient, effectively odorless and tasteless, just as the rules suggest. It is an alcoholic payload that exists mainly for effect, not for flavor. As a result, vodka cocktails present an interesting challenge for the cocktail designer. In order for a cocktail to have a reason to exist, it has to have some sort of interesting flavor thing going on. All other spirits provide a rich, identifiable backbone for cocktails; they channel the other flavors and hold the drink together. Classically, you would order a brandy cocktail, or a gin cocktail, or a whiskey cocktail, and you’d know pretty much what you were getting into. Vodka cocktails can’t rely on that fundamental complexity and backbone to generate interest. The hallmarks of vodka cocktails are lightness and simplicity, with flavor patterns dominated by externals like vermouth, juices and liqueurs. The art of the vodka cocktail is the art of the add-in. An intriguing example is Johnny Michaels’s caramel surprise, The Night of the Hunter. With Night of the Hunter, we see a huge serving of vodka providing a backdrop for small amounts of strongly flavored add-ins: Licor 43 and Oloroso sherry. On the face of it, Licor 43 doesn’t seem very promising. On its own, it’s really sort of dumb—the nose is all sugary vanilla, the flavor practically a vanilla syrup, with a little hint of caramel and orange peel in the aftertaste. The simplicity and sweetness of its flavor make you question the story that the liqueur’s name is derived from an alleged 43 secret ingredients. But when you mix it with other ingredients, the vanilla recedes, the sweetness is tempered, and additional flavors assert themselves. When you mix it with a splash of sherry and a bit of salt, the flavors become much more complex. Caramel and brown sugar flavors jump forward to dominate the mix. That caramel flavor, according to Michaels, is the whole point of The Night of the Hunter. Stir ingredients with ice until cold; strain into a chilled cocktail stem. Garnish with two almond-stuffed olives. Michaels recommends an Oloroso style sherry for Night of the Hunter. Oloroso typically has a bit more aging, and is a little earthier than other sherry styles; aging contributes a roasted nut flavor, and a hint of figs. The Sangre y Trabajadero that I used in this recipe also has some notes of citrus (orange, I think), and a slight saltiness. The trick is to work out just the right proportions of sherry and Licor 43 to get the caramel flavor to emerge without being overpowered by the sherry; this balance is different from one brand of sherry to another. In my case, a ratio of about 3:1 seems to work, but you may want more or less sherry depending on your brand. …and on your sensitivity to salt. I used one dropper full of 4:1 salt solution. Michaels recommends that before you start mixing with the vodka, you experiment with the balance of the Licor 43 and your chosen sherry to get it as close to “caramel” as you can. Once you have the best blend, add salt solution until until it tastes a bit too salty. When you add the vodka, the salt will balance out. The idea of Night of the Hunter is to make a very accessible, lightly flavored caramel cocktail. It’s meant to be on the sweet side (the Licor 43), tempered slightly by the earthiness of the sherry. Caramel is lightly salty, and the added salt solution should be just enough to encourage the idea of caramel, but enough not to give a sensation of saltiness. 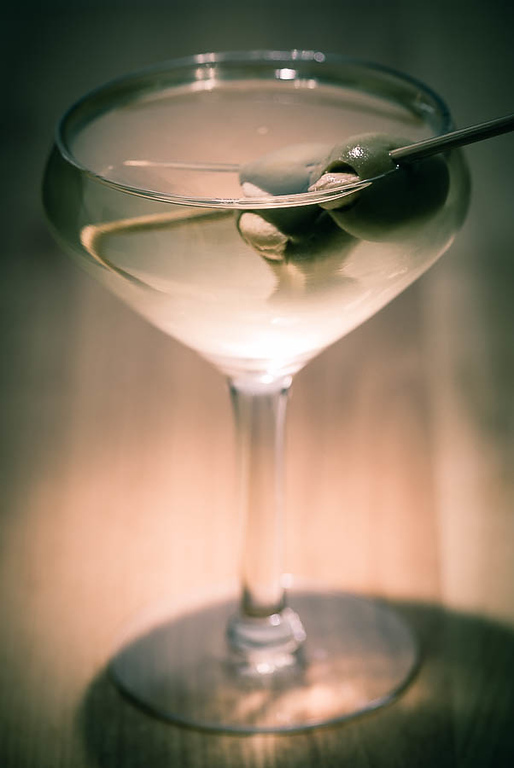 The olive garnish seems a bit peculiar—I’m not convinced it’s the natural match for the drink’s flavors, but the olives do seem to make a nice foil if the sweetness starts to be too one-dimensional. The Night of the Hunter is sweet and light, but that caramel trick is the “interesting flavor thing” that makes it worthwhile, and it is not something you could do with any other base spirit. Not everyone keeps Licor 43 and Oloroso sherry in the pantry, but if you have them available, this one vodka cocktail that makes for a fun change of pace. “Confounding Vodka: The Night of the Hunter” at cold-glass.com : All text and photos © 2014 Douglas M. Ford. All rights reserved. I am intrigued by the name of the cocktail – and your description. The ingredients seem to be worth hunting for. Johnny Michaels seems to be inspired by phrases from popular culture that catch his attention, like song and movie titles, song lyrics, even the names of rock bands. His drinks menus can be fun reads. 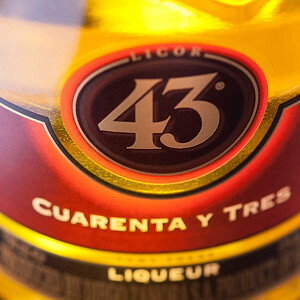 The Licor 43 should be easy to find. It seems strange to me that sherries—quality sherries—should be the more difficult ingredient. At least around here, there only seem to be a couple choices in any given wine shop. That’s an interesting observation, Licor 43 as an evening ender. Yes, that could work very well, thanks for the idea. I look forward to giving it a try. I like salted caramel, so this holds some promise. Thanks! I am not a great lover of flavored cocktails that disguise the taste of vodka. One of the reasons I am a big fan of the vodka martini. Vermouth is the ‘disappearing ingredient,’ and if it isn’t, it should be! I agree with your point, in general, and it gets right to the heart of the vodka cocktail, certainly. Focusing on flavor, you could say that Vodkaland is divided into (a) a nice cold glass of good vodka, and (b) everything else. The challenge, from my point of view, is to find drinks in the (b) class that are actually interesting and worthwhile. As for the dry vodka Martini, or Kangaroo, as it’s sometimes called, I agree that it should be very, very dry, with the vermouth approaching complete disappearance. I actually do find it interesting; I think my fascination lies in the idea that the Kangaroo is the only drink I know that assays the flavor boundary between cocktails and the straight glass of vodka. If you’re a vodka fan, this one’s for you. How do you like that Sangre y Trabajadero? I liked its size but man is that stuff potent. Between that and the 43, you’ve made a wonderfully Spanish cocktail. I don’t have a lot of experience with sherry, so it’s hard for me to compare the Sangre y Trabajadero with others. I was delighted by the modifying effect it had on the Licor 43, very surprising. I hadn’t thought of it until you mentioned—yes, it is a very Spanish cocktail. It would be amusing to make it with a Spanish vodka; alas! I’m not aware of any in my market. Thanks for taking time to comment, Raul.